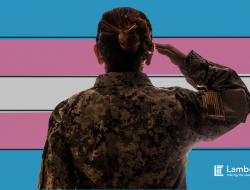 Where common usage o nce included identifiers “femme” and “butch” (for better or worse), increasingly today there are identities of transman, non-binary, and gender non-conforming, instead. Butch can feel like a slur: either disrespecting someone’s womanhood (as a throwback slur, or “too butch” for a woman), disrespecting someone’s manhood (refusing to see a transman as a man), or disrespecting someone’s ability to define their own gender or live gender-free. “Butch” is even used to describe men’s levels of masculinity, just as “femme” is commandeered by straight women. But rarely is butch used for women anymore, at least as a term of respect. At some point, consensual or not, “butch” fell out of favor. So what of the butches? For those women who are self-defined butches, their ability to self-determine is on ice. 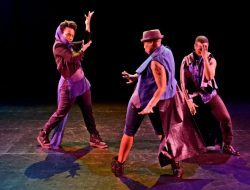 That self-determination is what Tail Feather is all about: butches strutting their love, their bravado, their insecurity, their sexuality, their Blackness, their femaleness, their masculinity, their butchness. 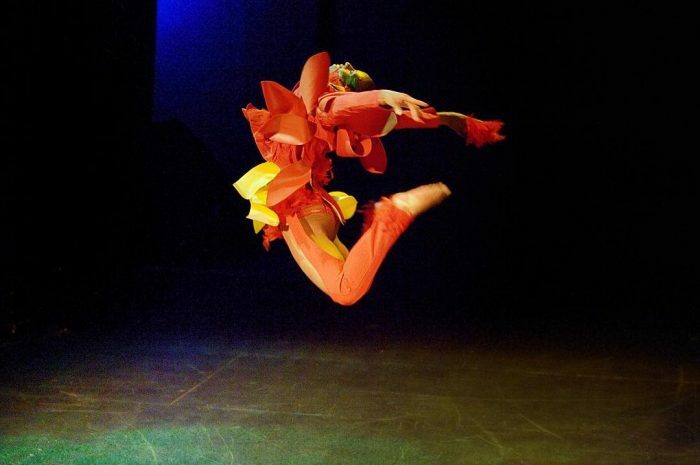 Tail Feather, a three-night-only performance on the historic main stage of the Langston Hughes Performing Arts Institute, arose from the reclamation and celebration of butch identity, and specifically queer Black butch identity, bringing together six queer, Black, butch performers to strut their stuff, showcasing both masculinity and femininity aspects of their butch identities. Created and directed by Earth Pearl Collective co-founder Sadiqua Iman, it stars six dancer/performers: Naa Akua, D’Dynasty, Justice, Namii (Iman’s performance persona), Seductive Tease, and Taqueet$. Also starring: the beats created right there on stage by queer pop artist Be Steadwell. 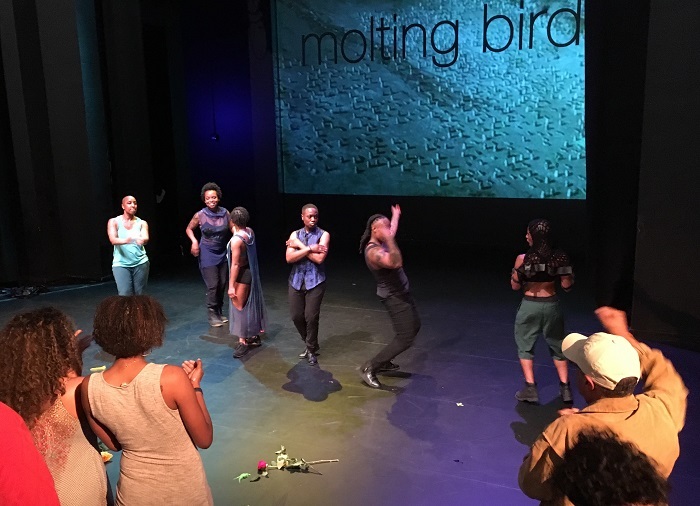 The inspiration for the title — and the theme arising in various ways throughout the performance — is the strutting and big plumage of male birds when they are showing off for a prospective mate (or, sometimes, defending their territory). Tail Feather uses male birds puffing up and strutting as inspiration for the dancers’ movements and their aesthetic. 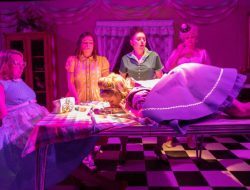 Depicting those roles, they’re aided by vivid, fantastical, and tear-away (rawr!!) 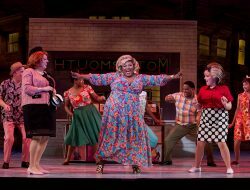 costumes created by Alia Kache, who’s also responsible for the show’s well-layered choreography and is Iman’s sister. From crow to peacock, the birds flock together, fly solo, or in pairs; they show off or, occasionally, they withdraw into their own shame and fall apart, feathers falling out. Often they compete, and sometimes they brawl — though these birds quickly make peace, in their stage personas at least. Performers of Tail Feather, receiving roses and a standing ovation at opening night. Photo by R Barron. 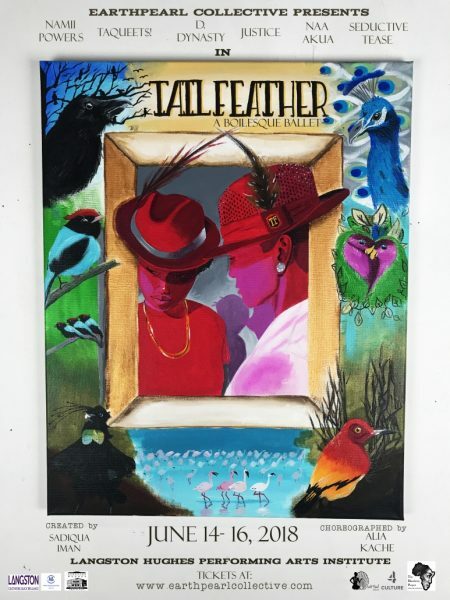 Tail Feather was only an hour of performance, but felt infinitely fuller, with the richness of music, costume, poetry, dance, bravado, vulnerability, sexuality … and the radical audacity simply to be, a queer Black butch in a society frequently uncomfortable with each, let alone all three. It’s a celebration of self-definition, worth celebrating, done beautifully well. Don’t miss it. Tail Feather runs through 6/16 at the Langston Hughes Performing Arts Institute, in the Central District (7:30 pm Friday & Saturday). Tickets $25, available here or at the door. 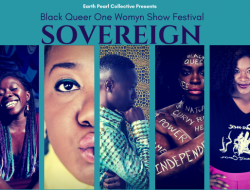 The show is produced by Earth Pearl Collective, a “Black queer womyn nonprofit dedicated to healing our community through creative collaborations.” Look forward to their second annual Sovereign Festival, coming this fall. You can read about the exceptional lineup at last year’s festival here, and about the organization here. 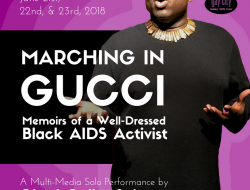 Marching in Gucci: Memoirs of a Well-Dressed Black AIDS Activist, written and performed by Chad Goller-Sojourner, 6/21-6/23 (7:30 pm Thursday & Friday, 3:30 & 7:30 Saturday). Tickets $20, available here or at the door.